CASTING ALERT IN ATLANTA, GA!!! I received an email from a talent agent to assist him with some last minute talent. Normally I only use my own clients who pay me, but because of the short notice, I have to reach more people and bring a few more people. This is a PAID Opportunity & great resume/portfolio material. DEADLINE is TODAY (03/21/14) by 5pm EST! Read instructions and email: royalkingdompr@gmail.com if you are interested with the following interview style video below. NO EXPERIENCE NECESSARY! REQUIRED-SHOOT A SHORT VIDEO- Interview style, record yourself answering the following question: What does sustainability mean to you? Talent needs to be articulate and comfortable on camera. Accents are good just need to be understandable. The video shoot will be interview style, with talent responding in their own words from their own beliefs, experiences, preferences etc but nothing specific to the client. Talent will be briefed on subject matter but there will not be a specific script. Needs to seem real, believable and authentic. Talent may be asked to be behind the wheel, shot inside the vehicle while driving. Other actions, walking. talking on phone etc. Nominate a Community Leader for the Mayor’s 2014 Day of Recognition! The nation’s mayors are coming together to unleash the power of our nation’s volunteers and citizen-leaders! Volunteer programs have long been at the forefront of community improvement and volunteer efforts nationwide– making all of our cities better places to live. To spotlight the impact of local and national service, Mayor A C Wharton, Jr. will join with mayors across the nation in recognizing and thanking those who serve during the second-annual “Mayors Day of Recognition for National Service” on April 1, 2014. We need your help for this very important event! Please submit the name of an individual or community group who has been committed to extraordinary service in the Memphis community. Award recipients will be recognized at City Hall on April 1st. Nominations close on March 18th, 2014. We look forward to celebrating our community, and the many wonderful people who choose to serve in it! The Office of Community Affairs at 901-636-6507, or via email at: communityaffairs@memphistn.gov. THE TIME IS NOW TO ENTER…. Are you between the ages of 15 and 25, and you enjoy using the power of Spoken Word to express your views, motivate others, while entertaining all within your view? 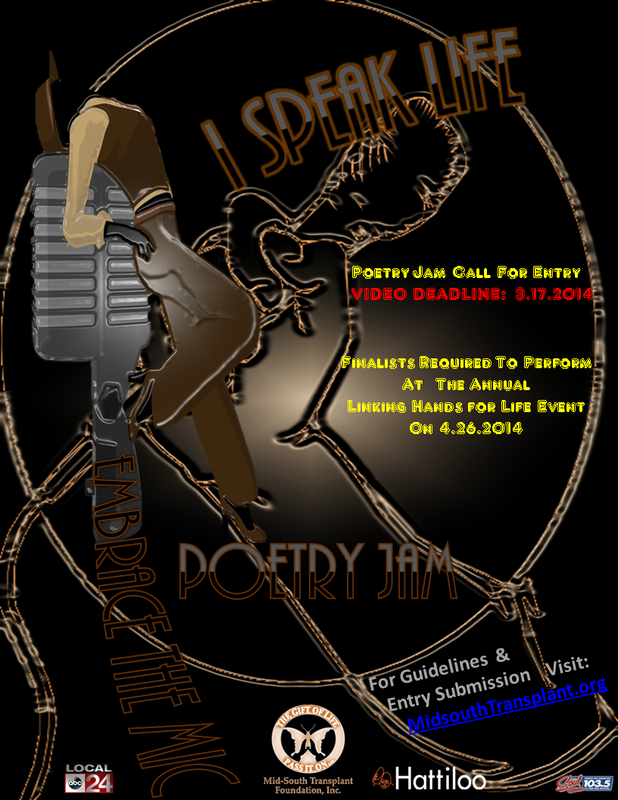 If you answered yes, or know of someone who does, then it’s time to find out how to enter the Mid-South Transplant Foundation’s Embrace the Mic Poetry Jam Contest, and showcase your talents! The National Civil Rights Museum will host the Drop the Mic Poetry Slam competition at the Rumba Room at 333 S. Main Street on Saturday (Feb. 22nd) from 4 p.m. to 8 p.m. Youth and young adults (15-25) will articulate their views on freedom. Celebrity judges are Danny Simmons, co-producer of “Def Poetry Jam,” along with Memphis natives Aisha Raison and multi-platinum hit-maker Drumma Boy. Looking for a grant opportunity to bring new resources into your classroom or school community? Listed below are several upcoming application opportunities. Don’t forget to check out the student opportunities listed at the bottom of the newsletter! The New York Life Excellence in Summer Learning Award recognizes outstanding summer programs that demonstrate excellence in accelerating academic achievement and promoting healthy development for young people between pre-kindergarten and twelfth grade. The award is given annually based on an application process that elicits information on a program’s history, mission, goals, operations, management, staff development, partnerships, results and sustainability. Applicants are reviewed by NSLA staff in addition to peer organizations in the field. Site visits are conducted to a select group of finalists to observe program activities before announcing the awards. Up to three winning programs will be awarded $10,000 from the sponsor, New York Life Foundation. Deadline: Friday, February 14, 2014, by 11:59 p.m. local time. Lowe’s Charitable and Educational Foundation (LCEF) knows how hard you work for your kids and your community and are dedicated to helping your parent-teacher group achieve even more for your school. Apply for Lowe’s Toolbox for Education Grant now and build on your already impressive parent group success with Lowe’s. Deadline: February 14, 2014. The Scrubbing Bubbles are on a mission to clean across America. Some reports show schools where children (and teachers) are in conditions NOT conducive to learning. If you are in one of those schools, or know of one, nominate the school to be cleaned. Enter by submitting a photo, video or text category through the Scrubbing Bubbles website, Facebook, Twitter, Instagram or vine. There must be only one entry per location. Winner receives the BIG CLEAN and a $500 donation. Deadline: February 14, 2014. Are you a Pre-K-12 classroom teacher who includes humane lessons in the curriculum or inspires students to act on behalf of animals? Do you know a teacher who has done so in an effective, innovative manner? If selected as National Kind Teacher, you or your nominee will receive a plaque, a packet of grade-appropriate humane education materials, and a scholarship to Humane Society University’s Certified Humane Education Specialist program. Deadline: February 15, 2014. Each year, the National Book Foundation awards a number of prizes of up to $2,500 each to individuals and institutions—or partnerships between the two—that have developed innovative means of creating and sustaining a lifelong love of reading. The “Real Men Read” program at Crenshaw Memorial Public Library is a recent recipient. Deadline: February 19, 2014. Acer is offering K-12 schools across the country an opportunity to transform their classrooms with immersive tablet technology that promotes 21st century learning. Educators across the United States are spending their own money to improve their classrooms. The Acer Classroom Technology Makeover is designed to help alleviate some of that burden for educators. Tablets enhance the learning experience by making it more engaging for the students and encouraging collaboration to explore more! The contest winner will be determined by public voting and will receive a classroom set of Acer ICONIA W Series Tablets featuring Windows 8. Approximate retail value is $15,000 (for 30 tablets). Deadline: February 21, 2014. Two lucky schools (grades K-3 and 4-6 winners) will win a spellbinding school assembly that not only is fun and interactive but also underscores the importance of science literacy. Deadline: February 27, 2014. Summer Reading Grants up to $3,000 provide funding to local nonprofit organizations and libraries to help with the implementation or expansion of summer reading programs. Programs must target Pre-K through 12th grade students who are new readers, below grade level readers, or readers with learning disabilities. For questions about how your school can apply through a nonprofit, contact the grants office at 416-4257. Deadline: February 27, 2014 (11:00 p.m. CST). The Follett Challenge is the popular contest that rewards innovation in education, and this year they are offering more awards, a brand new semi-finalist category, and a huge opportunity for all types of schools to highlight their programs. Schools will compete through essays and a video to be recognized as having one of the most innovative libraries that helps the school align curriculum and works collaboratively with others in the school to teach the skills needed to prepare students for the demands of the 21st century. Deadline: February 28, 2014. Stanley Bostitch appreciates everything teachers do to help inspire and sharpen kids’ minds. Stanley Bostitch would like to present teachers the opportunity to win one of three prize packs filled with an assortment of Stanley Bostitch school supplies and a $25 iTunes gift card to help you rock out! The Grand Prize is a $2500 Prize Pack! Simply complete the online Sweepstakes Entry Form online or mail in a completed form. Deadline: February 28, 2014. Calling all trailblazers, visionaries and innovators! The annual ISTE awards recognize exceptional educators and leaders who are paving the way for connected learning. They are seeking those whose exemplary work provides a model for teaching, learning and leading in the digital age. Award categories are: Outstanding Leader Award, Outstanding Teacher Award, Outstanding Young Educator Award, Sylvia Charp Award for District Innovation, Public Policy Advocate Award, Kay L. Bitter Vision Award, SIGLIB (SIGMS) Technology Innovation – Primary, SIGLIB (SIGMS) Technology Innovation – Secondary, SIGOL Online Learning Award, SIGTE Award for Excellence in Teacher Education, President’s Volunteer Service Award, and Making IT Happen Award. Deadline: February 28, 2014. The Presidential Innovation Award for Environmental Educators recognizes outstanding kindergarten through grade 12 teachers who employ innovative approaches to environmental education and use the environment as a context for learning for their students. Up to two teachers from each of EPA’s 10 regions, from different states, will be selected to receive this award. The White House Council on Environmental Quality (CEQ), in partnership with the U.S. Environmental Protection Agency (EPA) administers this award to nationally honor, support and encourage educators who incorporate environmental education in their classrooms & teaching methods. Deadline: February 28, 2014. The AP Fellows program is an annual competitive grant program that provides scholarships for secondary school teachers in the U.S. to attend AP Summer Institutes. AP Summer Institutes provide an excellent opportunity for teachers to gain command of a specific AP subject and to receive up-to-date information on the latest curriculum changes. Scholarships are available to teachers from schools that serve minority or low-income students who have been traditionally underrepresented in AP courses. The $1,000 scholarships assist teachers with the cost of attending an AP Summer Institute. Deadline: March 1, 2014. The National Endowment for the Humanities (NEH) funds tuition-free summer programs for school and college educators. Participants receive stipends to help cover travel and living expenses. Programs are held across the U.S. and abroad. These one- to five-week study opportunities focus on important topics, texts, and questions in the humanities; enhance the intellectual vitality and professional development of participants; build a community of inquiry and provide models of excellent scholarship and teaching; and promote connections between teaching and research in the humanities. Deadline: March 4, 2014. For the past 18 years, Mantis has provided the Mantis Awards to charitable and educational garden projects that enhance the quality of life in their host communities. To date, Mantis has provided 296 programs with tillers. This year, NGA will select 25 outstanding applicants to receive Mantis tillers/cultivators. Any non-profit garden program may apply. In the past, winners have included schools, churches, correctional facilities, parks departments, youth camps, community gardens, and many others. Twenty-five programs will each receive a Mantis Tiller/Cultivator with border/edger and kickstand, and their choice of gas-powered 2-cycle engine or electric motor (valued at $349). Schools are eligible applicants. Deadline: March 7, 2014. Teachers may enter daily. Elementary teachers have the chance to win up to $10,000: $5,000 to support health and wellness initiatives at their school and an additional $5,000 for the teacher! All prize money will fund health and wellness education. Second and third prizes winners: Two teachers will win $1,000 AND $1,000 for their schools to fund health and wellness initiatives. Deadline: March 11, 2014. Ezra Jack Keats Foundation is offering mini-grants of $500 for public schools and public libraries to foster creative expression, working together, and interaction with a diverse community. Deadline: March 15, 2014 at 11:59 pm. The Biology Educator Leadership Scholarship (BELS) program was established to encourage and support teachers who want to further their education in the life sciences or life science education. The award recipient is required to be a practicing educator who is also enrolled (or anticipates enrolling) in a graduate program at Masters or Doctoral level. NABT members with less than or equal to ten years of teaching experience are eligible. The BELS program is sponsored by NABT Members and PASCO scientific and includes a $5000 tuition assistance award, a plaque to be presented at the NABT Professional Development Conference, and one year of complimentary membership to NABT. Deadline: March 15, 2014. The Kim Foglia AP Biology Service Award recognizes an AP Biology teacher, who displays a willingness to share materials, serves as a mentor to both students and professional colleagues, creates an innovative and student-centered classroom environment, and exemplifies a personal philosophy that encourages professional growth as an AP biology teacher and member of that community. Sponsored by Pearson and NABT, the Kim Foglia AP Biology Service Award includes a $1000 honorarium, a recognition plaque to be presented at the NABT Professional Development Conference, and one year of complimentary membership to NABT. Deadline: March 15, 2014. Every year, the Outstanding Biology Teacher Award (OBTA) program attempts to recognize an outstanding biology educator (grades 7-12 only) in each of the 50 states; Washington, DC; Canada; Puerto Rico; and overseas territories. Candidates for this award do not have to be NABT members, but they must have at least three years of public, private, or parochial school teaching experience. A major portion of the nominee’s career must have been devoted to the teaching of biology/life science, and candidates are judged on their teaching ability and experience, cooperativeness in the school and community, inventiveness, initiative, and student-teacher relationships. OBTA recipients are special guests at the Honors Luncheon held at the NABT Professional Development Conference; receive microscopes from Leica Microsystems, gift certificates from Carolina Biological Supply Company, and award certificates and complimentary one-year membership from NABT. The nomination deadlines and criteria vary by state. Please contact Tennessee’s OBTA Director for more information (http://www.nabt.org/websites/institution/index.php?p=86). This award, sponsored by Pearson, Ken-A-Vision and NABT, recognizes outstanding teaching (grades 7-12 only) by a “new” biology/life science instructor within his/her first three years of teaching (when nominated) who has developed an original and outstanding program or technique and made a contribution to the profession at the start of his/her career. The award includes a travel fellowship, microscope, and recognition plaque to be presented at the NABT Professional Development Conference, and one year of complimentary membership to NABT. Deadline: March 15, 2014. To support the Civil Air Patrol’s aerospace education programs, the AFA provides aerospace education grants for Civil Air Patrol units. Since 1996, the AFA has provided over $240,000 to CAP units and teachers to help fund their aerospace education programs. Grants are for $250. Grants must be used for aerospace education-related items/activities such as books, materials, equipment, videotapes, aerospace-oriented field trips, and aerospace education events for youth in schools and/or community organizations and/or events. Deadline: March 31, 2014. The Presidential Awards for Excellence in Mathematics and Science Teaching (PAEMST) are the highest honors bestowed by the United States government specifically for K-12 mathematics and science (including computer science) teaching. Established by Congress in 1983, the PAEMST program authorizes the President to bestow up to 108 awards each year. Awards are given to mathematics and science (including computer science) teachers from each of the 50 states and four U.S. jurisdictions. The award recognizes those teachers who develop and implement a high-quality instructional program that is informed by content knowledge and enhances student learning. Awardees serve as models for their colleagues, inspiration to their communities, and leaders in the improvement of mathematics and science (including computer science) education. The National Science Foundation administers PAEMST on behalf of The White House Office of Science and Technology Policy. Recipients of the award will receive a certificate signed by the President of the United States, a paid trip for two to Washington, D.C., to attend a series of recognition events and professional development opportunities, and a $10,000 award from the National Science Foundation. Over the years, ten MCS or SCS teachers have been honored, most recently teachers from Bolton High (2009) and John P. Freeman (2008). Deadline: April 1, 2014. The LEGO Children’s Fund provides grants for collaborative programs to organizations that focus on early childhood education and development; technology and communication projects that advance learning opportunities; or sport or athletic programs that concentrate on underserved youth. The maximum award is $5,000. Deadline: April 15, July 15, and October 15, 2014. Enter the Toyota Teen Driver School Sweeps for your chance to win a Virtual Driving Simulator and cash for your school to inspire and create awareness around the leading cause of teenage death in the U.S. – distracted driving. One lucky winner will win a prize package of $5,000 cash and a Virtual Driving Simulator for their school! Plus, $1,000 cash prizes to 10 Runners-Up Schools! Enter once a day, and every day until April 15, 2014, to increase your chances of winning. Deadline: April 15, 2014. The McCarthey Dressman Education Foundation offers Academic Enrichment Grants (up to $10,000 per year for a maximum of three years) designed to develop in-class and extra-curricular programs that improve student learning. The Foundation considers proposals that foster understanding, deepen students’ knowledge, and provide opportunities to expand awareness of the world around them, with a focus on nurturing the intellectual, artistic and creative abilities of children from low-income households. Cordova High and Overton are recent recipients of the Academic Enrichment grant. Deadline: April 15, 2014. The McCarthey Dressman Education Foundation Teacher Development Grants provide funding to individuals or small teams of teachers in the formation and implementation of groundbreaking K-12 classroom instruction. The grants (up to $10,000 per year for a maximum of three years) provide opportunities for teachers to integrate fresh strategies that encourage critical inquiry and to observe their effects on students. Teachers have the opportunity to reflect and write about their projects, as well as to share their results with other teachers. Deadline: April 15, 2014. The Music Is Revolution Foundation administers a mini-grant program for Music Is Revolution activities designed by teachers to implement, support, and/or improve their ability to provide quality music education for their students. Mini-grants up to $500 are available to teachers for music education activities of all types. Funds may be used for supplies, materials, equipment, transportation for a field trip, and/or to bring a performer or musical group to the school. Deadline: April 15 and October 15, 2014. Are you an educator with a class project that is short on funding but long on potential? Do you know a teacher looking for grant dollars? ING Unsung Heroes could help you turn great ideas into reality for students. Each year, 100 educators are selected to receive $2,000 to help fund their innovative class projects. Three of those are chosen to receive the top awards of an additional $5,000, $10,000 and $25,000. Among the previous winners of $2,000 grants are teachers from Bolton High, Downtown Elementary, Klondike Elementary, Shrine School, and White Station Elementary. Deadline: April 30, 2014. The purpose of this grant is to provide financial assistance to elementary schools for in-service education in mathematics. For 2014–2015, grants of a maximum of $4,000 each will be awarded to elementary schools. Costs may include honoraria/expenses for consultants, materials, substitute time, and conference/workshop registrations. No funds may be used for staff travel or equipment. While this grant does not fund the purchase of technology, proposals including professional development involving the use of technology to enhance student learning are encouraged. Proposals must address the following: need, mathematics content, scope of the plan, other contributing sources of funding, number of teachers and students affected distribution of costs, urban-rural isolation, and multiethnic student body. Deadline: May 2, 2014 (postmark). Youth Literacy Grants (up to $4,000) provide funding to schools, public libraries and nonprofit organizations to help students who are below grade level or experiencing difficulty reading. Grant funding is provided to assist in the following areas: Implementing new or expanding existing literacy programs, purchasing new technology or equipment to support literacy initiatives, and purchasing books, materials or software for literacy programs. Deadline: May 22, 2014 (11:00 p.m. CST). Grants are made for activities that conform to the mission of the Captain Planet Foundation which is: To give the next generation of environmental stewards an active understanding and love for the natural world in which they live. Awards from $250 to $2,500 are granted for initiatives that support hands-on environmental projects involving children and youth. Rolling deadlines are May 31, 2014 and September 30, 2014. The NEA Foundation provides grants to support public school teachers, public education support professionals, and/or faculty and staff in public institutions of higher education for one of the following two purposes: Grants to individuals fund participation in high-quality professional development experiences, such as summer institutes or action research; or grants to groups fund collegial study, including study groups, action research, lesson study, or mentoring experiences for faculty or staff new to an assignment. The grant amount is $2,000 for individuals and $5,000 for groups engaged in collegial study. All $5,000 group grant applicants must include partner information. Deadline: June 1, 2014, and October 15, 2014. The NEA Foundation provides grants to improve the academic achievement of students in U.S. public schools and public higher education institutions in any subject area(s). The proposed work should engage students in critical thinking and problem solving that deepen their knowledge of standards-based subject matter. The work should also improve students’ habits of inquiry, self-directed learning, and critical reflection. Grant funds may be used for resource materials, supplies, equipment, transportation, technology, or scholars-in-residence. Although some funds may be used to support the professional development necessary to implement the project, the majority of grant funds must be spent on materials or educational experiences for students. Deadline: June 1, 2014, and October 15, 2014. Kids In Need Teacher Grants provide PreK-12 educators with funding to provide innovative learning opportunities for their students. The Kids In Need Foundation helps to engage students in the learning process by supporting our most creative and important educational resource — our nation’s teachers. Grant applications are available online each year from July 15 until September 30. The Hoenny Center studies PreK-12 peer teaching and wants proposals for classroom action research projects that focus on peer teachers’ motivations, teaching strategies, and rewards; and/or on classroom techniques that professional educators use to improve peer teaching by students. Deadline: July 1, 2014. TAF offers grants of up to $1,000 for K-6 teachers, in public or private schools, for the creation of projects designed to improve instruction for students in grades 7-12. The Foundation strongly encourages projects planned and led by individual teachers or teams of teachers for their own classrooms. Toshiba America Foundation believes science and mathematics are exciting fields in which all students can succeed with the proper tools and instruction. TAF uses two application forms: An elementary school application (Grades K-5) and a middle and high school application (Grades 6-12). Grade K-5 applications are accepted once a year on October 1. Grade 6-12 applications for $5,000 or less are accepted on a rolling basis, throughout the calendar year. Grant requests of more than $5,000 are reviewed twice a year. Applications for grants of more than $5,000 are due February 1 and August 1 each year. Multiple deadlines. Each business day 4imprint gives a worthy organization $500 in promotional products to spread the word, recruit volunteers, thank donors, offer comfort to someone in need, or in some other way turn one thing into something much more. Schools are eligible applicants. No set deadline. Advancing Student Achievement is a grant program that brings together actuaries and educators in local classroom environments with the belief that interaction with real-world mentors will boost students’ interest and achievement in math (Grades 4-12 only). The Actuarial Foundation can provide a local network of actuaries ready to participate, as well as suggestions on how to integrate math concepts from the workplace into the classroom. Groups applying for grants will be given wide latitude in designing programs that enhance learning and create a “love of math” in each student. Grants can be for up to $5,000 for a total of 6 years. No set deadline. Adopt-a-Classroom is a simple program for teachers across the United States. Over 200 Memphis classrooms are already registered. Teachers simply discuss their classroom needs and their school. Donors can select classrooms they wish to fund by grade and location. Teachers can get their classrooms “adopted” once a year. This means a sponsor has donated $500 to a teacher’s classroom. The teacher then completes a purchase form online and the materials are ordered and delivered to the teacher’s school. No set deadline. The AIAA Foundation has established a Classroom Grant program specifically for use by AIAA Educator Associates. If you are a K-12 teacher interested in the development or application of science, mathematics, and technology within your educational curriculum, you may qualify for a grant of up to $200 per individual request to supplement your learning program. Each school is limited to up to $1,000 per calendar year. Use your grant for classroom demonstration kits, classroom science supplies, or other materials to enhance the teaching-and learning-of science, mathematics, and related technology. Requests are due 9 weeks before the planned purchase date. Deadline: Rolling. Awesome Food, a chapter of the worldwide Awesome Foundation, is accepting grant applications to further food awesomeness in the universe. Each month, Awesome Food will give one applicant $1,000 to help pull off an awesome idea involving food. The ideas must relate to food in some form, and the definition will be more inclusive than exclusive. Examples could include educating the public about DIY-farming, creating an ad-hoc eatery in a subway car, or recording videos of immigrants’ recipes. Anyone is eligible to apply: for profit, nonprofit, individuals, companies, schools, adults and children. The $1,000 grants are not loans or investments. They are not expected to be paid back. They are no-strings attached grants. Applications are reviewed as they are received. One grant is awarded each month. Deadline: Rolling. Submit a lesson plan to win over 50 different grants from Digital Wish. Prizes are usually educational technology tools supplied by corporate partners. Multiple deadlines. Take the donorschoose plunge early in the school year to take advantage of special campaigns such as Sonic’s Limeades for Learning. No set deadline. Funded by The Corning Incorporated Foundation. The purpose of this funding is to support initiatives that improve the quality of life in and near communities where Corning Incorporated is an active corporate citizen. Grants are available in the areas of educational improvement, cultural enrichment, and community service involvement. Deadline: Rolling. Grants support music instruction. The foundation is currently awarding acoustic guitars, electric guitars, acoustic-electric guitars, bass guitars and the equipment necessary to play these instruments. However, other traditional music instruments (string, woodwind, brass, percussion, keyboards) are sometimes available. No set deadline. truTV has developed free Forensics in the Classroom units in collaboration with NSTA (aligned with middle school and high school standards). After using the units, answer a brief survey. The completed survey will serve as your application for the $1,000 Educational Grant. truTV will award one grant per year. No set deadline. An administrative fee of 10% of the equipment’s retail value must be paid after an application has been approved. This fee helps to defray the shipping, handling, and administrative costs of making the equipment donation. Schools can only apply for more than one sport if the programming rotates through multiple sports/activities, such as a physical education class. Those organizations should apply under the sport, “General Recreation.” Schools with multiple teams should submit one application for the sport with the greatest need. Deadline: Rolling (at least eight weeks prior to the sports season’s start). The Pet Care Trust is awarding Pets in the Classroom Grants to K-6 teachers who wish to teach children how to care for pets. In order to receive a grant, teachers must shop at a local pet supply store. Grant certificates will be distributed in the amounts of $50, $100, or $150 and may be used to purchase new pets, pet environments, or pet food and supplies for existing classroom pets. Only one grant award per school per year will be made. Teachers may apply only once a year. No set deadline. No funds will be awarded. Successful applicants will receive a free Speed Stacks Sport Pack ($299 value) to allow the incorporation of speed stacks into a P.E. program. Rolling (apply by the 15th of each month). Sponsored by Office Depot, Recycling Rules is open to K-12 schools whose teachers, principals, and administrators recycle ink and toner cartridges that are not visibly damaged. In addition to receiving credit for recycled cartridges, schools may also receive credit for recycling small electronics, such as cell phones and MP3 players. At the end of each month, Office Depot will award a credit to each school’s account. Once an account’s value exceeds $25, Office Depot will send the designated school an Office Depot gift card. Deadline: Rolling. This company provides you the box and pays the shipping. For each 40-pound box of paired shoes which you collect, your school will receive a check for $20. Your students can include a “SoleMate” note to find out where their shoes end up in the world. No set deadline. Various contests for teachers are sponsored throughout the year. Multiple deadlines. With TeacherLists.com, it’s super easy to post your teachers’ wish lists online – and you can reach all parents, instantly – so it’s a great way to complement (or start!) a wish list program at your school. If 20 teachers in a school post a list by 8/31/2013, the school will be entered in a teachers’ lounge makeover contest. If 20 teachers in a school post a list by 10/15/2013, the school will receive a FREE School Supply Stash containing $125 of supplies (while supplies last). No set deadline. Every spring, 30 top high school students and exceptional educators from across the U.S. and Africa are selected to participate in this year-long leadership development program. The program kicks off with an all-expenses-paid scholarship to attend the acclaimed Aspen Ideas Festival (AIF), a remarkable gathering of thinkers and change agents from around the world. Throughout the academic year, Scholars participate in virtual Bezos Scholars Program trainings and are invited to apply for a $1,000 seed grant to design and implement their Local Ideas Festival. Deadline: February 18, 2014. Earth Day Network is excited to announce the second annual Sustainability Journalism Award. Open to high school students ages 13 to 18, the competition seeks to bring hard facts on environmental and sustainability issues to entire school communities – in the students’ own words. This year we have opened the competition to include broadcasting and photography entries! It’s a competition for high school journalists (print, broadcasting, and photography) on topics related to sustainability. First prize: $500. Second prize: $250. Third prize (x3) $100. Deadline: February 28, 2014. The American Chemical Society Scholars Program awards renewable scholarships of up to $5,000 to underrepresented minority students who want to enter the fields of chemistry or chemistry-related fields, such as environmental science, toxicology and chemical technology. High school seniors and college freshmen, sophomores, or juniors are eligible to apply. The ACS Scholars Program was established in 1994 to attract African American, Hispanic and American Indian students considered underrepresented in the chemical sciences by the National Science Foundation to pursue careers in the field. The program also aims to help build awareness of the value and rewards associated with careers in chemistry and assist students in acquiring skills and credentials needed for success. Application Cycle: November 1 – March 1 (annually). Students write an essay, poem, or thank-you letter (500 words or less) sharing how a teacher has influenced their life and why they appreciate and admire them. Students who author the winning essays, poems, or thank-you letters will receive a certificate of recognition and be honored at their local store during a ceremony for the winning teachers from their schools. Winning teachers will be recognized at a special event at their local store and will receive a special award acknowledging their achievement, together with additional recognition. The six regional winners will each receive a NOOK eBook Reader and a $500 gift card. The winner of the “Barnes & Noble Teacher of the Year” award will receive $5,000. The winning teacher’s school will receive $5,000 as well. Deadline: March 1, 2014. The year 2014 marks 50 years since the creation of the National Academy of Engineering (NAE). Much has changed in that half century! Think about how engineering has affected your life. How has it improved people’s quality of life? What further needs of society could be addressed by engineering? In honor of the NAE’s 50th anniversary, we invite you to imagine how engineering might change our lives over the next 50 years, in areas of Nutrition, Health, Communication, Education, and Transportation. It is challenging to imagine what the future will bring, and we think that you are up to the task. In 1500 words or less describe how engineering has addressed one of these five areas of societal need (e.g. Transportation) in the past 50 years and suggest ways that engineering could address this area of need in the next 50 years. First-place winners will be awarded $500. Second-place entries will be awarded $250. Third-place entries will be awarded $100. Honorable Mention entries will not receive a cash award but will be published on the Engineer Girl Website. Deadline: March 1, 2014 at 6:00 pm EST. The Young Naturalist Awards is pleased to announce a new award for the 2014 competition that honors the legacy of visionary conservationist Theodore Roosevelt. Roosevelt’s lifelong passion for nature led him to become America’s greatest conservation president. To commemorate his legacy, the Theodore Roosevelt Memorial Award will be presented to an urban student whose investigation demonstrates close observation, thoughtful analysis, and deep appreciation of the biodiversity, ecology, and habitats found in an urban environment. The winning essay will be selected from the pool of Young Natural Award entrants and will be evaluated according to the same criteria. There is no separate submission process. Deadline: March 1, 2014 at 11:59 p.m. EST. The Community Foundation invites you to explore scholarship opportunities to help you achieve through education. In 2014-15, the Community Foundation is offering 17 scholarships, most for graduating high school seniors who intend to enroll in a two- or four-year program at an accredited institution. Most available scholarships fall in the $1,000-$2,000 range, and often several are awarded in each category. Most applications are due April 1, 2014 with the exception of the Don Poier Memorial Scholarship, which is due March 3, 2014. All applications should be submitted by mail to the Community Foundation of Greater Memphis. Multiple deadlines. Help save lives and WIN! The first year after a teen gets their license will be one of the most dangerous years of their life. (Source: National Safety Council). Teens have the power to inspire fellow teens; maybe better than a teacher or a parent can because you know what messages will be the most powerful. That’s why the Toyota Teen Driver Video Challenge empowers teens to put that vision on camera and save teen lives! If your friends were going to watch ONE video that made them think twice about making bad decisions behind the wheel, what would that video be? 1st Place Prize – $15,000 and the opportunity to work with a Discovery Film Crew to finalize your video! 2nd Place Prize – $10,000 and a behind-the-scenes trip for two to a Discovery Channel Velocity show! 3rd Place Prize – $7,500. Deadline: March 13, 2014. The SYTA Youth Foundation established the Road Scholarship program in 2002 to award funds to youth who, for various reasons, are unable to afford the cost of their group’s travel. Based on the belief that travel is essential to a complete education, it is the SYTA Youth Foundation’s goal to make a positive difference, through travel, in the young lives of our global citizens. Since its inception, the SYTA Youth Foundation has awarded over a thousand scholarships to deserving youth. Scholarships are awarded based on the applicant’s circumstances and need as documented in the completed application form. The scholarship amount varies on a case-by-case basis, depending on the cost of specific trips, the demonstrated need of the applicant, and the number of applicants in a given application period. The average Road Scholarship granted is $750.00. No more than $1,000.00 will be awarded to a single student. Deadline: March 15, 2014. Outstanding student members of a NABT BioClub are eligible for a textbook scholarship from Carolina Biological Supply Company. One student from each BioClub Chapter can be nominated, with the student being a graduating senior or two year college students who has been accepted to a two or four year college/university. In addition to the textbook scholarship, an award plaque will be presented to the student in May. This is a great way to recognize that exceptional student that inspires you to be an even better biology teacher. Please see the NABT BioClub for complete information. Deadline: March 31, 2014. The Gloria Barron Prize for Young Heroes celebrates inspiring, public-spirited, highly diverse young people from all across America. Each year, the Barron Prize honors twenty-five outstanding young leaders ages 8 to 18 that have made a significant positive difference to people and our environment. The top ten winners each receive a $5,000 cash award to support their service work or higher education. The primary goal of the Prize is to shine the spotlight on these amazing young people so that their stories will inspire others. Deadline: April 15, 2014. CVS Caremark has a long tradition of supporting the academic aspirations of young scholars. One of the ways we achieve this is by offering children of full-time employees the opportunity to apply for a CVS Caremark Corporate Scholarship, funded by the CVS Caremark Charitable Trust. The future success of the company, the health of the community, and the overall prosperity of the economy relies heavily on the educational system and its accessibility to students. CVS Caremark is proud that this program has helped hundreds of students achieve their goal of furthering their education. Deadline: April 25, 2014. High school seniors who are legal residents in Tennessee are eligible for these drawings. One entry per drawing, but students can register during each drawing period. Every two weeks a $1,000 scholarship will be given. Eligibility is not based on GPA or financial need. Scholarship funds must be used for tuition, fees, books, supplies and equipment required for study, and scholarship checks are mailed directly to the college. Bi-monthly drawings through May, 2014. Do Something Disaster Grants fund project ideas and existing projects that assist people in emergency situations – everything from disaster preparedness to first responders to those who are still working hard to rebuild months or years later. Applicants must be under the age of 25. One award of $500 will be given each week. Great projects include those that do something about food insecurity, help soldiers returning from active duty, rebuild communities after natural disasters, or provide resources for those afflicted by a crisis. No set deadline. Are you working to start a community action project or program? Do you need money to put your ideas into action? If you answered “YES!” you are eligible to apply for a Do Something Seed Grant. $500 Do Something Seed Grants are given out every week to help young people just like YOU! Do Something Seed Grants are targeted towards project ideas and programs that are just getting started. These grants can be used to jump-start your program or to realize your ideas for the first time. These are grants for all types of community action projects around causes that you care about and are important in your community! You will be notified whether or not you have won within 2-3 months after submission. No set deadline. Youth-led school, community, and faith-based groups with an environmental focus can sign up to become a partner of Greening Forward’s Earth Savers Club Program. (It is free to become a partner.) Partners are granted access to a number of resources, including mini grants ($100-500), social activism training, mentorships, and the Earth Saver Award. No set deadline. WaysToHelp.org invites teens in the United States to apply for grants to fund their community service ideas across any one of 16 issue areas. Applications are short – just 5,000 characters or less – and should summarize: how the project will involve others, who it will help, what effect it’s expected to have, when it will start and how the funds will be used. Grant requests are reviewed and responded to on a monthly basis. No set deadline. 10 a.m.-6 p.m. Saturday in the East Hall of the Memphis Cook Convention Center. Tickets: $10 in advance, $12 at the door; children 5 and under free. Advance tickets are available Brinson’s Tax Service, 1864 Madison. For more information, go to blackexpomemphis.com. An opening night networking reception is at 7 p.m. on Friday at the downtown nightclub Brinson’s, 341 Madison, featuring music by Jerome Chism and M-Town Band. Admission is $10. And on Sunday at 7 p.m., there will be a fashion and art show at the Bridges Center, 477 North Fifth Street. Tickets: $15 at the door, $10 in advance. Advance tickets are available at Brinson’s Tax Service. Memphis Mayor A C Wharton, Jr. and his wife, Attorney Ruby Wharton, are seeking nominations for the Ruby R. Wharton Award to honor exceptional women who have made outstanding contributions to the Memphis area. The awards will be presented by Mayor Wharton during the Twelfth Annual Tea and Talk at the Top on Sunday, February 9, 2014 at 3:00 p.m., in City Council Chambers. Nomination forms for the Ruby R. Wharton Award may be obtained from the City of Memphis website by visiting http://www.memphistn.gov. Deadline for nominations is 4:00 p.m. Friday, January 24, 2014. Please return nomination information to Catherine.green@memphistn.gov or fax the information to 636‐6588.